“Monks, this is the one-way path for the purification of beings, for the complete transcendence of sorrow and lamentation, for the disappearance of pain and depression, for the attainment of the way, for the realization1 of Nibbāna – that is, the four establishments of mindfulness. “What four? Monks, a monk abides observing the body as the body2 – dedicated, completely aware, and mindful, without covetousness or depression about the world. One abides observing feelings as feelings… the mind as the mind… phenomena3 as phenomena – dedicated, completely aware, and mindful, without covetousness or depression about the world. “Monks, how does a monk abide observing the body as the body? “Monks, a monk who has gone to the forest, to the base of a tree, or to an empty building sits down, crosses his legs, sets his body upright, and establishes mindfulness as foremost4. One breathes in mindfully, one breathes out mindfully. “In this way, one abides observing the body as the body internally, or one abides observing the body as the body externally, or one abides observing the body as the body both internally and externally. Or one abides observing the nature of manifestation in relation to the body, or one abides observing the nature of cessation in relation to the body, or one abides observing the nature of both manifestation and cessation in relation to the body. Or mindfulness that ‘There is the body’ is established to the extent necessary for knowledge and awareness. And one abides independent, and one does not cling to anything in the world. Monks, in this way a monk abides observing the body as the body. “Or in whatever way the body is positioned, one understands it as it is. “In this way, one abides… observing the body as the body. “Monks, a monk is completely aware while moving forward or backward. One is completely aware while looking around or examining. One is completely aware while contracting or extending one’s limbs. One is completely aware while wearing one’s robes and carrying one’s bowl. One is completely aware while eating, drinking, chewing, and swallowing. One is completely aware while defecating and urinating. One is completely aware while moving, standing, sitting, reclining, awake, speaking, and silent. “Monks, just as if a monk were to see a corpse discarded in a cemetery – one, two, or three days old – that was bloated, discolored, and festering, he would compare it to this body: ‘This body is also of that nature, it is becoming like that, it is not exempt from that.’ In this way, one abides… observing the body as the body. “Monks, just as if a monk were to see a corpse discarded in a cemetery that was being eaten by crows, hawks, vultures, dogs, jackals, and worms, he would compare it to this body: ‘This body is also of that nature, it is becoming like that, it is not exempt from that.’ In this way, one abides… observing the body as the body. “Monks, how does a monk abide observing feelings as feelings? “In this way, one abides observing feelings as feelings internally, or one abides observing feelings as feelings externally, or one abides observing feelings as feelings both internally and externally. Or one abides observing the nature of manifestation in relation to feelings, or one abides observing the nature of cessation in relation to feelings, or one abides observing the nature of both manifestation and cessation in relation to feelings. Or mindfulness that ‘There are feelings’ is established to the extent necessary for knowledge and awareness. And one abides independent, and one does not cling to anything in the world. Monks, in this way a monk abides observing feelings as feelings. “Monks, how does a monk abide observing the mind as the mind? “Monks, a monk understands a lustful mind as a lustful mind. “He understands a lust-free mind as a lust-free mind. “He understands a hate-filled mind as a hate-filled mind. “He understands a hate-free mind as a hate-free mind. “He understands a delusional mind as a delusional mind. “He understands a delusion-free mind as a delusion-free mind. “He understands a focused mind as a focused mind. “He understands a scattered mind as a scattered mind. “He understands an expanded mind as an expanded mind. “He understands an unexpanded mind as an unexpanded mind. “He understands a surpassable mind as a surpassable mind. “He understands an unsurpassable mind as an unsurpassable mind. “He understands a concentrated mind as a concentrated mind. “He understands an unconcentrated mind as an unconcentrated mind. “He understands a liberated mind as a liberated mind. “He understands an unliberated mind as an unliberated mind. “In this way, one abides observing the mind as the mind internally, or one abides observing the mind as the mind externally, or one abides observing the mind as the mind both internally and externally. Or one abides observing the nature of manifestation in relation to the mind, or one abides observing the nature of cessation in relation to the mind, or one abides observing the nature of both manifestation and cessation in relation to the mind. Or mindfulness that ‘There is the mind’ is established to the extent necessary for knowledge and awareness. And one abides independent, and one does not cling to anything in the world. Monks, in this way a monk abides observing the mind as the mind. “Monks, how does a monk abide observing phenomena as phenomena? “Monks, a monk abides observing phenomena as phenomena in relation to the five obstacles. Monks, how does a monk abide observing phenomena as phenomena in relation to the five obstacles? “Monks, if there is sensual desire in a monk, he understands ‘There is sensual desire in me,’ or if there is no sensual desire in him, he understands ‘There is no sensual desire in me.’ He understands the arising of unarisen sensual desire, the abandoning of arisen sensual desire, and the future non-arising of abandoned sensual desire. “If there is doubt in him, he understands ‘There is doubt in me,’ or if there is no doubt in him, he understands ‘There is no doubt in me.’ He understands the arising of unarisen doubt, the abandoning of arisen doubt, and the future non-arising of abandoned doubt. “In this way, one abides observing phenomena as phenomena internally, or one abides observing phenomena as phenomena externally, or one abides observing phenomena as phenomena both internally and externally. Or one abides observing the nature of manifestation in relation to phenomena, or one abides observing the nature of cessation in relation to phenomena, or one abides observing the nature of both manifestation and cessation in relation to phenomena. Or mindfulness that ‘There are phenomena’ is established to the extent necessary for knowledge and awareness. And one abides independent, and one does not cling to anything in the world. Monks, in this way a monk abides observing phenomena as phenomena in relation to the five obstacles. “Monks, a monk abides observing phenomena as phenomena in relation to the five components10 when affected by attachment11. Monks, how does a monk abide observing phenomena as phenomena in relation to the five components when affected by attachment? “Monks, a monk knows the body, the manifestation of the body, and the disappearance of the body; he knows feelings, the manifestation of feelings, and the disappearance of feelings; he knows recognition, the manifestation of recognition, and the disappearance of recognition; he knows mental constructs12, the manifestation of mental constructs, and the disappearance of mental constructs; he knows consciousness, the manifestation of consciousness, and the disappearance of consciousness. “In this way, one abides… observing phenomena as phenomena in relation to the five components when affected by attachment. “Monks, a monk abides observing phenomena as phenomena in relation to the six internal and external sense-domains13. Monks, how does a monk abide observing phenomena as phenomena in relation to the six internal and external sense-domains? “Monks, a monk understands the eye, sights, and the fetter that arises dependent on both; he understands the arising of an unarisen fetter, the abandoning of an arisen fetter, and the future non-arising of an abandoned fetter. “He understands the ear, sounds… the nose, odors… the tongue, flavors… the body, tangibles… the mind, mind-objects, and the fetter that arises dependent on both; he understands the arising of an unarisen fetter, the abandoning of an arisen fetter, and the future non-arising of an abandoned fetter. “In this way, one abides… observing phenomena as phenomena in relation to the six internal and external sense-domains. “Monks, a monk abides observing phenomena as phenomena in relation to the seven enlightenment factors. Monks, how does a monk abide observing phenomena as phenomena in relation to the seven enlightenment factors? “Monks, if there is the mindfulness enlightenment factor in a monk, he understands ‘There is the mindfulness enlightenment factor in me,’ or if there is no mindfulness enlightenment factor in him, he understands ‘There is no mindfulness enlightenment factor in me.’ He understands the arising of the unarisen mindfulness enlightenment factor, and the perfection of the mindfulness enlightenment factor through development14. “If there is the investigation enlightenment factor… the energy enlightenment factor… the rapture enlightenment factor… the tranquility enlightenment factor… the concentration enlightenment factor… the equanimity enlightenment factor in a monk, he understands ‘There is the equanimity enlightenment factor in me,’ or if there is no equanimity enlightenment factor in him, he understands ‘There is no equanimity enlightenment factor in me.’ He understands the arising of the unarisen equanimity enlightenment factor, and the perfection of the equanimity enlightenment factor through development. “In this way, one abides… observing phenomena as phenomena in relation to the seven enlightenment factors. “Monks, a monk abides observing phenomena as phenomena in relation to the four noble truths. Monks, how does a monk abide observing phenomena as phenomena in relation to the four noble truths? “Monks, a monk understands suffering15 as it is; he understands the cause of suffering as it is; he understands the cessation of suffering as it is; he understands the practice which leads to the cessation of suffering as it is. “Monks, what is the noble truth of suffering? Birth is suffering, decrepitude is suffering, dieing is suffering; sorrow, grief, pain, depression, and anguish are suffering; involvement with what one dislikes is suffering; separation from what one likes is suffering; not getting what one wants is suffering; briefly, the five components [of existence] when affected by attachment are suffering. “Monks, what does ‘not getting what one wants is suffering’ mean? “Monks, what is the noble truth of the cause of suffering? The craving which is connected with continued existence, accompanied by delight and lust17, and seeks delight in various ways – that is, craving for sensuality, craving for existence, and craving for non-existence18. “Monks, when craving is manifesting, where does it manifest? When it is becoming ingrained19, where does it become ingrained? Anything in the world that has a likable form, a pleasant form – this is where craving manifests when it is manifesting, this is where it becomes ingrained when it is becoming ingrained. “What in the world has a likable form, a pleasant form? “In the world, the eye has a likable form, a pleasant form – this is where craving manifests when it is manifesting, this is where it becomes ingrained when it is becoming ingrained. In the world, the ear… nose… tongue… body… mind has a likable form, a pleasant form – this is where craving manifests when it is manifesting, this is where it becomes ingrained when it is becoming ingrained. “Evaluation about sights… sounds… odors… flavors… tangibles… mind-objects has a likable form, a pleasant form – this is where craving manifests when it is manifesting, this is where it becomes ingrained when it is becoming ingrained. “Monks, what is the noble truth of the cessation of suffering? The complete fading, cessation, discarding, relinquishing, release, and non-abiding of that craving. “Monks, when craving is being abandoned, where is it abandoned? When it is ceasing, where does it cease? Anything in the world that has a likable form, a pleasant form – this is where craving is abandoned when it is being abandoned, this is where it ceases when it is ceasing. “The eye… ear… nose… tongue… body… mind… sights… sounds… odors… flavors… tangibles… mind-objects… eye-consciousness… ear-consciousness… nose-consciousness… tongue-consciousness… body-consciousness… mind-consciousness… eye-contact… ear-contact… nose-contact… tongue-contact… body-contact… mind-contact… feelings produced by eye-contact… ear-contact… nose-contact… tongue-contact… body-contact… mind-contact… recognition of sights… sounds… odors… flavors… tangibles… mind-objects… volition related to sights… sounds… odors… flavors… tangibles… mind-objects… craving for sights… sounds… odors… flavors… tangibles… mind-objects… thoughts of sights… sounds… odors… flavors… tangibles… mind-objects… evaluation about sights… sounds… odors… flavors… tangibles… mind-objects has a likable form, a pleasant form – this is where craving is abandoned when it is being abandoned, this is where it ceases when it is ceasing. “Monks, what is the practice which leads to the cessation of suffering? It is the noble eightfold path – that is, right perspective20, right attitude, right speech, right action, right livelihood, right effort, right mindfulness, and right concentration. “Monks, what is right concentration? “Monks, secluded from sensuality, secluded from unwholesome phenomena, a monk attains and remains in the first Jhāna, which has thought, evaluation, and the rapture and happiness produced by seclusion. “With the abatement of thought and evaluation, one attains and remains in the second Jhāna, which has internal serenity, mental focus, no thought, no evaluation, and has the rapture and happiness produced by concentration. “With the abandoning of pleasure and pain, and with the prior disappearance of elation and depression, one attains and remains in the fourth Jhāna, which is neither painful nor pleasant and has purity of mindfulness and equanimity. “In this way, one abides… observing phenomena as phenomena in relation to the four noble truths. “Monks, whoever develops these four establishments of mindfulness in this way for seven years can expect to attain one of two results: final knowledge in this life23; or, if there is some remainder24, non-return. “Monks, let alone seven years – whoever develops four establishments of mindfulness in this way for six years… five years… four years… three years… two years… one year… seven months… six months… five months… four months… three months… two months… one month… a fortnight… seven days can expect to attain one of two results: final knowledge in this life; or, if there is some remainder, non-return. This is what the Blessed One said. Satisfied, the monks delighted in the Blessed One’s speech. 1 Sacchikiriya. From saccha (truth) + kiriya (action). 2 Kāye kāyānupassī. Lit. “Observing the body in the body.” The locative tense in Pāli is often used to indicate reference rather than a literal location – that is, “in” can mean “in terms of”, “in reference to”, “in the context of”, etc. 4 Parimukha. There is much controversy over the proper translation of this term. 5 Kāya-saṅkhāra. Lit. “body-construct.” The term saṅkhāra means “conditional phenomenon.” So the term kāya-saṅkhāra appears to mean “the conditional phenomenon of the body.” It is rendered here simply as “body” for the sake of clarity. 7 Dhātu. This is not ‘element’ in terms of physical science, but rather ‘element’ in terms of perceived experience. The four elements refer to the four primary characteristics of physical experiences – namely, solidity, cohesion, temperature, and motion. 8 Sāmisa. Lit. “with meat”. 9 Nirāmisa. Lit. “not meat”. 10 Khandha. The five khandha are the five components of personal existence. 11 Upādāna. When there is desire and attachment in relation to the components of existence, they are called pañcūpādānakkhanda – the five components when affected by attachment. 12 Saṅkhāra. This can be distinguished from the more general term “mind-object” as referring to the more complex formations of mind, such as full-fledged emotions, thoughts, ideas, memories, etc. 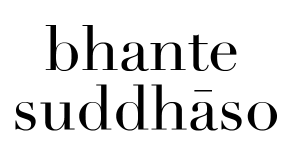 14 Bhāvanā. Lit. “bringing into being.” This term is commonly used to refer to meditation. 15 Dukkha. Lit. “hard to endure.” This can refer to any unpleasant experience, from the most mild to the most extreme. It it also used to mean the innate inability of an experience to be completely satisfying. 16 Satta-nikāya. In Buddhist cosmology, beings are classified into groups of beings with similar characteristics, such as humans, animals, different kinds of spirits, etc. 18 Vibhava. Lit. “separation from existence.” In addition to craving for total non-existence, this can also refer to craving to avoid particular states of existence. 22 Briefly, “wrong livelihood” is any form of work which causes harm to oneself or others; and “right livelihood” is any form of work which does not cause harm to oneself or others. 23 Diṭṭheva dhamme aññā. That is, full enlightenment.